I was watching The Chew last Friday (again) and saw Carla Hall & Daphne Oz make this incredible muffin stuffing recipe, and decided this was going to be on menu this year since I’m just cooking for one (me). I really love the idea of individual servings, and the fact that you can customize these babies when serving a group. The original recipe calls for using sausage, but I substituted bacon since I had some in the fridge. I also halved the recipe, which produced six “muffins”, but am giving you the ingredients to make a dozen. I made these tonight to test them out, and have to say, they’re seriously delicious! I plan on reheating them tomorrow in the oven to accompany the rest of my turkey day meal. Have the cornbread in a large mixing bowl. Heat a saute pan over medium-high heat. Add 2 tablespoons of olive oil to the pan and add bacon. Once the bacon is cooked, remove it & break into pieces to the bowl of cornbread. Add the butter to the pan and then toss in the onions, scallions, celery and red pepper. Season with salt and pepper. Saute until soft, about 5 minutes. Add the vegetables to the bowl. Then, add the chicken stock, the seasonings, milk, and egg. Toss lightly to combine. 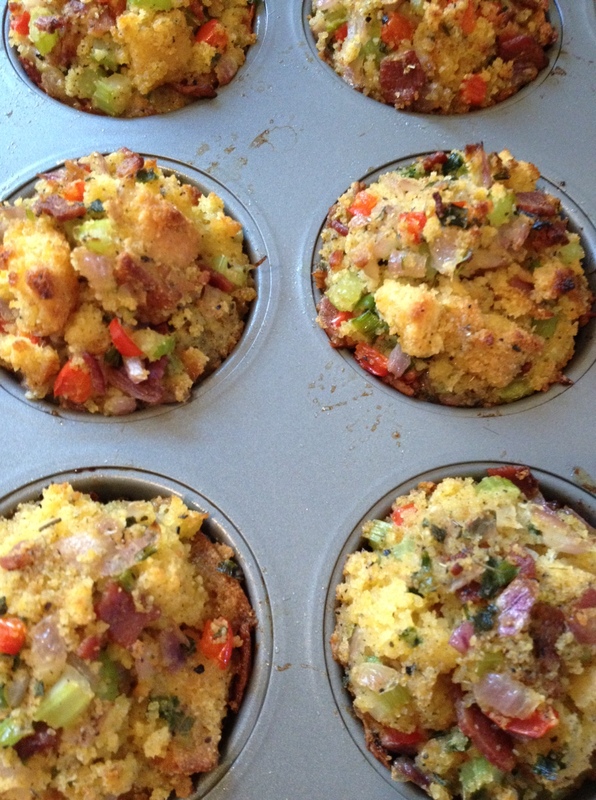 Butter the muffin tins and then spoon the cornbread in. Compress the muffins and then add more stuffing on top. Bake for 15-20 minutes or until just lightly browned. Let cool for 5 minutes before removing from tins. This entry was posted in Bread, Muffins, etc., Recipes, Side Dishes and tagged celery, cornbread, dressing, onions, red pepper, stuffing. Bookmark the permalink.